(ScienceDaily) Mar. 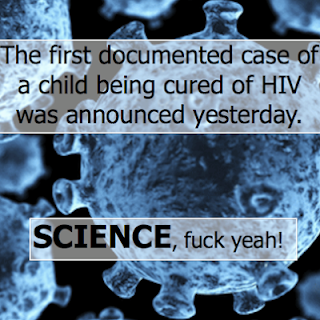 3, 2013 — Researchers today described the first documented case of a child being cured of HIV. The landmark findings were announced at the 2013 Conference on Retroviruses and Opportunistic Infections in Atlanta, GA.
Dr. Deborah Persaud, of Johns Hopkins University and an amfAR grantee, detailed the case of a two-year-old child in Mississippi diagnosed with HIV at birth and immediately put on antiretroviral therapy. At 18 months, the child ceased taking antiretrovirals and was lost to follow-up. When brought back into care at 23 months, despite being off treatment for five months, the child was found to have an undetectable viral load. A battery of subsequent highly sensitive tests confirmed the absence of HIV. Confirmation of the cure was made possible by a grant the Foundation awarded to Dr. Persaud and Dr. Katherine Luzuriaga of the University of Massachusetts in September 2012. The grant allowed Drs. Persaud and Luzuriaga to establish a research collaboratory to explore and document possible pediatric HIV cure cases. The collaboratory includes renowned researchers Drs. Stephen Spector and Doug Richman at the University of California, San Diego; Dr. Frank Maldarelli at the National Cancer Institute; and Dr. Tae-Wook Chun at the National Institute of Allergy and Infectious Diseases. "The child's pediatrician in Mississippi [Dr. Hannah Gay, a pediatric HIV specialist at the University of Mississippi] was aware of the work we were doing, and quickly notified our team as soon as this young patient's case came to her attention," said Dr. Rowena Johnston, amfAR vice president and director of research. "Because the collaboratory was already in place, the researchers were able to mobilize immediately and perform the tests necessary to determine if this was in fact a case of a child being cured." The only other documented case of an HIV cure to date remains that of Timothy Brown, the so-called "Berlin patient." In 2006, while on treatment for HIV, Mr. Brown was diagnosed with leukemia. His physician was able to treat his leukemia with a stem-cell transplant from a person who was born with a genetic mutation causing immunity to HIV infection. Following the transplant, Mr. Brown was able to stop HIV treatment without experiencing a return of his HIV disease. This new case points to the tantalizing possibility that different populations of HIV-positive people might be cured in different ways. While Mr. Brown's case was the outcome of a complex, high-risk, and expensive series of procedures, this new case appears to have been the direct result of a comparatively inexpensive course of antiretroviral therapy. "Given that this cure appears to have been achieved by antiretroviral therapy alone," said Dr. Johnston, "it is also imperative that we learn more about a newborn's immune system, how it differs from an adult's, and what factors made it possible for the child to be cured." "We are proud to have played a leading role in bringing this first pediatric HIV cure to light," said amfAR CEO Kevin Robert Frost. "The case is a startling reminder that a cure for HIV could come in ways we never anticipated, and we hope this is the first of many children cured of HIV in the months and years to come." Story Source: The above story is reprinted from materials provided by amfAR, The Foundation for AIDS Research.